Statistics compiled by the Health Research Board show an increase in alcohol-related deaths since 2004. STATISTICS PUBLISHED TODAY show that the number of alcohol-related deaths recorded in Ireland is on the rise. The Health Research Board’s statistics show that the number of deaths caused by alcohol, increased significantly in Ireland between 2004 and 2008. While the number of people dying as a direct result of alcohol poisoning fluctuated throughout those years, the number of non-poisoning deaths among alcohol dependants rose from 508 in 2004 to almost 800 three years ago. In the five-year period alcoholic liver disease was the most prevalent cause of death, accounting for almost a quarter of the deaths, while cardiac conditions (17.2 per cent) and respiratory infections (11.4 per cent) were also common causes. Almost two-thirds of the deaths occurred in people under the age of 64, with the median age of an alcohol-related death standing at just 59. The majority of alcohol-related deaths occurred in males. Around half of the deaths involving alcohol poisoning also involved the abuse of other substances. In those cases, benzodiazepines and opiates – which include heroin and methadone – were the two most common drugs implicated in deaths. The median age of death for people dying solely of alcohol poisoning was 48. When other substances were also involved, that median age dropped to 41. Alcoholic liver disease accounted for over a third of all alcohol-related deaths in those aged between 25 and 34. Just under 40 per cent of alcohol-related deaths involving a trauma were the result of falls, while hanging accounted for almost a fifth of traumatic deaths. Dr Suzi Lyons of the HRB said that alcohol consumption in Ireland, per capita, was among the highest in Europe and that over half of Irish people drank in a harmful manner. 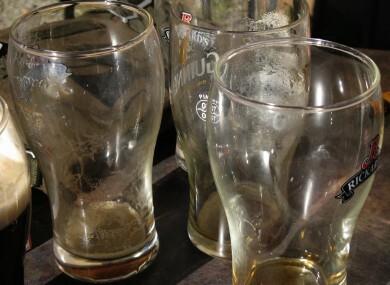 Email “Alcohol-related deaths on the rise in Ireland”. Feedback on “Alcohol-related deaths on the rise in Ireland”.